Lets begin our Chinese Dream, Register NOW ! The “Chinese Bridge” — Chinese Proficiency Competition for Foreign College Students is a large-scale international competition organized by Hanban. Since its launch in 2002, this annual event has been attracted more than hundred college students from 97 countries to participate in its semi-finals and finals in China. In addition, there are more than 50,000 students all over the world involved in the preliminary rounds. This competition is now an important platform for international college students to learn the Chinese language and more about China. It also serves to help young people in the world better communicate with each other. The contents of the competition include Chinese Language Proficiency, Knowledge about China, Chinese Cultural Skills and Comprehensive Learning Abilities. Students who win the preliminary rounds held in their countries will qualify to come to China for the finals. They will also get scholarships to further their studies in China. During the event, they will have a chance to take part in various cultural activities. The competition is held yearly and is organized and carried out by the Organizing Committee. 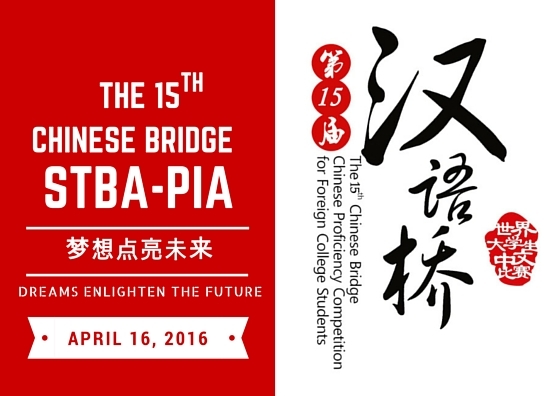 So, before going to the national competition of Chinese Bridge (Indonesia Region), Our Chinese Literature Department of STBA-PIA will hold the Internal Selection Competition in April with the topic “Dreams Enlighten the Future 梦想点亮未来”. The contents of competition include: Chinese Language Proficiency, Knowledge of China, Chinese Cultural skills. 1. Registrant should join the Technical Meeting at R.202. 2. Registrant should submit the music performance to Mr. Anthony Hualangi / Ms. Karina (R.202) on TM. 3. Registrant’s guidance tutor is the Lecturer of Chinese Comprehension Subject. For further information, please click download button below.